Chegg has long been known as a textbook company, becoming one of the first companies to bring textbook rental online and reach widespread adoption. But with Amazon, Apple and others moving aggressively into the textbook market — and the market and textbooks themselves increasingly going digital — Chegg has been re-positioning. Today, the textbook company is eying EdTech’s Holy Grail of becoming the OS for students (or in their words, a student’s academic hub), a big change for a company that launched behind the Textbookflix.com URL back in 2005. This means the company has been adding course reviews and planners, scholarship help, course search and tutoring, as it expands to offer a wider range of student services. On the other hand, CTO Chuck Geiger tells us, those services have little value if students can’t access them across platforms. So, Chegg has been on a mission to provide that access to its services at any time, on smartphones, tablets laptops and every platform in between. It’s already launched “Chegg Flashcards” and its original app, which allows students to rent, search for and purchase digital textbooks. 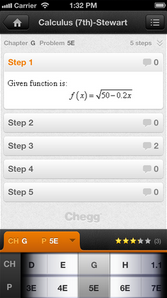 Today, Chegg launched a new app for iOS called Chegg Textbook Solutions, which aims to help students solve those tricky textbook problems. The new app includes over 2.5 million step-by-step textbook solutions from over 2,000 popular college textbooks and allows students to search book-by-book and chapter-to-chapter for the content they need. The idea is to let students learn at their own pace, going through the process one step at a time, and if they run into hurdles, to ask the community for help. 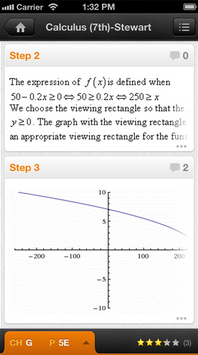 Students can also rate and suggest corrections, rating solutions from 1 to 5 stars. The company, which says that it now reaches 30 percent of college students on 7K campuses across the country, is offering the new textbook app for free. However, the full service itself will only be free for 30 days. After that, it will cost $14.95. The real benefit of Textbook Solutions is that the app acts like a companion to students’ regular textbooks and offers the kind of answer guide that teachers usually get access to but students don’t. But, more importantly, Geiger says, the solution isn’t there to just give students the answers outright, the app aims to help them understand how to arrive at the correct answer. Plus, it has that interactive element by allowing students to reach out to the community to ask questions when they get stuck. The company is also updating its original, flagship app today, which allows students to use the their phone’s camera to scan ISBN numbers, QR codes, enter the title, author to search for and find text (and textbooks). Textbook Solutions for iOS includes this search functionality, too, though the new app focuses on problem sets, while Chegg’s original, eponymous app lets students read eTextbooks on the go and helps them save money with price comparisons and extended purchase options. Today, the CTO tells us, Chegg’s demographics still skew more towards higher ed, but as the company has grown, it’s been seeing a larger portion of its user base made up of high school students. It still makes the majority of its revenue from students buying and renting textbooks, but, again, through its acquisitions of Zinch, 3D3R and CourseRank (to name a few), it’s been slowly diversifying. The company continues to show today that the focus there is really on mobile, as the company’s mobile traffic doubled over the last year and its mobile orders (from its flagship app) have increased 80 percent year-over-year. In 2012, Geiger added, one in four of Chegg eReader sessions was on mobile. As such, Chegg has smartly committed to the goal of becoming a real eCommerce portal for high school and college students — on the Web and on mobile — where it sees huge potential. With the value of academic content decreasing as it moves to the web and digital devices, Chegg can still benefit handsomely from becoming the intermediary or middle man in the digital content game between students and publishers. As of now, the company has been looking to make strides in the user experience of reading textbooks online and on your tablet. Chegg launched its popular eReader HTML5 app a year ago and has developed several patents for the techniques it uses to cache content on a mobile browser. Of course, with its new native app, students don’t have to worry about as many caching restrictions or slow rendering. Going forward, Chegg will look to take more advantage of living natively on student devices. It’s been more concerned with cross-platform compatibility up to this point, but by making more use of a phone’s GPS, for example, Chegg can begin to offer a realtime, high-res campus map students can access at the beginning of the term or school year. Anything that enables the company to offer more digital products and services to students at a faster pace is a good thing, the CTO says. In the future, look for Chegg to begin experimenting more with the personalization of learning content as well. The topic has become a hot one in edtech communities over the last year, and even the big publishers like McGraw-Hill have jumped headlong into the game. Chegg already offers personalized scholarship services, and the “best” content from “The Big Four” publishers (McGraw-Hill, Pearson, Cengage and Wiley), but with its growing access to students on mobile devices — especially during their reading experience — there are a lot more opportunities for Chegg to make the learning process better. The company’s mission is now to “to save students time, money and get them smarter.” You’ll notice there’s no longer any mention of textbooks in that mission statement, but if Chegg really hopes to follow-through with the first and third parts of that statement, it will need to keep pushing forward here. By expanding its services, it’s begun to allow itself to make money beyond the times of year when students are buying textbooks, but really this should be about the student — and student outcomes. And while a textbook answer key is sure to pique their interest, adaptive learning technologies (when done right) can ensure that personalization becomes part of the Chegg experience.